A substance found in parasitic worms’ spit might help prevent thousands of amputations a year, scientists in north Queensland have said. James Cook University researchers in Cairns are harnessing the molecule produced by a Thai liver parasite that can “supercharge” the healing of wounds. Bandages are intended to keep a dressing secure and clean in order to reduce healing time and infection rate. However, they may be about to get a new use-case, courtesy of a project from the United Kingdom’s Swansea University Institute of Life Science. A glass-based wound care product that emerged from research by a doctoral student at Missouri University of Science and Technology has been approved by the U.S. Food and Drug Administration for human use and is now available on the commercial market. Nash UNC Health Care is continuing its effort to bring cutting-edge technology to the hospital. At a time when governments are under pressure to reduce healthcare costs, the global advanced wound care market is growing, driven by an aging population and rising incidences of chronic wounds. 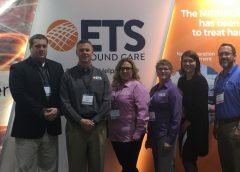 ROLLA, Mo.–(BUSINESS WIRE)–ETS Wound Care LLC, an Engineered Tissue Solutions (ETS) subsidiary focused on commercializing next generation wound care solutions, announced MIRRAGEN™ Advanced Wound Matrix was cleared by the United States Food and Drug Administration (FDA) for treatment of acute and chronic wounds. MIRRAGEN™ is a fully resorbable borate glass matrix comprised of fibers and beads proven to be highly effective in wound care management.